SARAJEVO, BOSNIA & HERZEGOVINA – On March 18, 2015, AIPR launched a new initiative to engage communities across Bosnia and Herzegovina—religious, governmental, academic, and civil society—and work with them towards developing a network of organizations that will educate and act in the spirit of genocide and mass atrocity prevention. 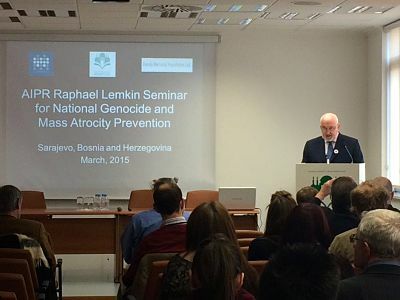 The Raphael Lemkin Seminars for National Genocide and Mass Atrocity Prevention included a seminar from March 19 – 20 for thirty-five representatives from various organizations both in and outside of Sarajevo that work on peace building, reconciliation, education, and inter-faith dialogue. A follow-up seminar was held on March 21 for fifty-one graduate and undergraduate-level students from the region. The seminars were organized with the support of the Carnegie Corporation of New York. Mr. Hasan Nuhanovic, a survivor of the Srebrenica genocide who campaigns today on behalf of other survivors and relatives of the victims, opened the Sarajevo seminars. Opening remarks were also delivered by seminar co-organizers, including Dr. Mustafa Ceric, Grand Mufti Emeritus of BiH, Mr. Vedad Cengic, Executive Director of the Family Memorial Foundation and Mr. Esmir Ganic, Vice-President for International and Government Relations at the American University in BiH. The seminar was a critical first-step towards a long-term mechanism to counter the threat of mass atrocities through preventive awareness and action. There was a lot of great discussion and participation from attendees, and a tremendous level of enthusiasm to increase engagement on prevention-related issues. For more information about the Sarajevo seminars—including our future plans in this region—please contact Mr. Mayerhofer.